The problem with large ladders is that they take up entirely too much space when not in use. The solution is this cool new Telesteps 1600EP - Telescoping Extension Ladder. 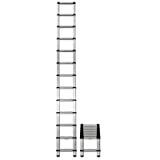 When stored, this ingeniously compact telescoping extension ladder is only 30 inches high and when fully extended out at 12.5 feet tall, it gives the user a maximum 16 foot reach. 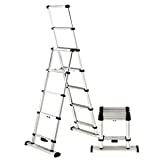 It features a one touch release mechanism for fully automatic extension and retraction, wide professional steps for comfort, 100% silicone pivoting feet for a safe grip, OSHA compliance, and the ladder can either be raised foot by foot when raised from the bottom rung or fully extended when raised from the top rung. Best of all, this space-saving ladder only weighs 25 lbs and is perfect for your home, boat, RV, construction site, or anywhere you might need a handy ladder. Available in additional sizes as well.